They are known for their late lunch and dinners. They are known for their afternoon siestas and 3 cups of cafe con leche a day. They are known for starting the party at 3 a.m. and coming home after sunrise. If you are partying with a Spaniard, don’t be surprised to hear shouted more than a couple times a night “campeones del mundo” or “viva España.” You know you’re on board with a Spaniard when red wine and ham is offered the second you step on board. If you want to sleep early, don’t raft up next to a Spanish boat because it is more than likely you will be talked into joining them until 8 o’clock in the morning for some drinks and crazy dancing. If you are a skipper for a group of Spaniards, have patience at all meal times. Your lunch will be their midmorning snack and your tea time will be their lunch time. So, expect to have lunch at around 2 p.m. and dinner at around 10 p.m. while everyone else is slowly starting to get to the parties. Fashionably late happens naturally for the Spaniards at The Yacht Week because all parties start when they are just about to prepare dinner. Join a Spanish crew if you want to mix it up a bit and listen to reggaeton instead of house music. 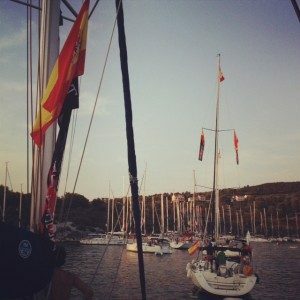 Join a Spanish crew if your drinks have run out. 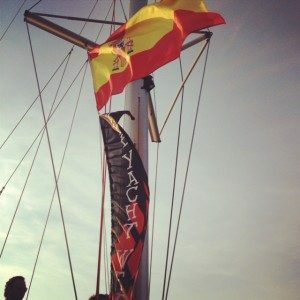 Join a Spanish crew if you are looking for an after party. Join a Spanish crew if you have run out of bread and coffee. If you are ready to stay up for the longest time you have ever done in you life and really have a good time, join a Spanish crew.